Making your own crackers is one of those things that seems a lot more complicated than it actually is. 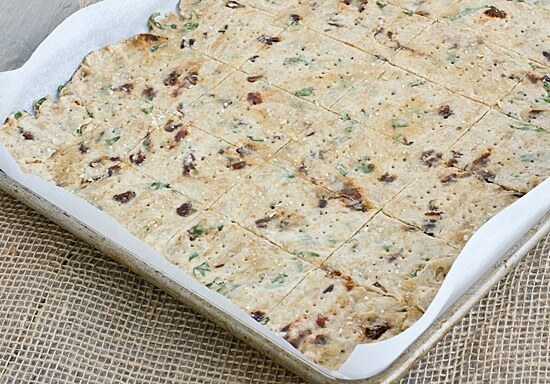 But this works in your favor, because when you make these delicious Basil & Sun-Dried Tomato Crackers, people are going to be really impressed. You don’t have to tell them that it was easy, either. Just let them be in awe of your culinary skills. I had wanted to make crackers for a while, but in my head, it was some epic process like canning or making caramels (which I’ve done and it was most definitely an epic process). Crackers, however, are not an epic process at all. They’re a little bit fussy, but they’re fairly easy to make and quick too. Take the time to chop the sun-dried tomatoes into very small pieces. If they stick out from the dough, they’ll burn. Don’t overwork the dough. Don’t do it! I always overwork dough. But if you overwork the dough for these crackers, they’ll be tough. Make sure the dough is rolled out to a uniform thickness. You don’t want burnt edges and a soft middle. Once I corrected my mistakes, the crackers turned out perfect. And then I basked in the glory of making my own crackers. Like Martha Stewart! Except Martha Stewart would probably get hers right the first time. So maybe not like Martha Stewart. But anyway! I made crackers. You can make crackers. Let’s make some crackers! 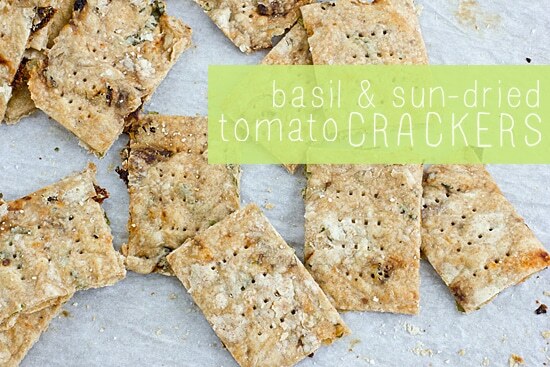 Homemade crackers are much easier to make than you think! 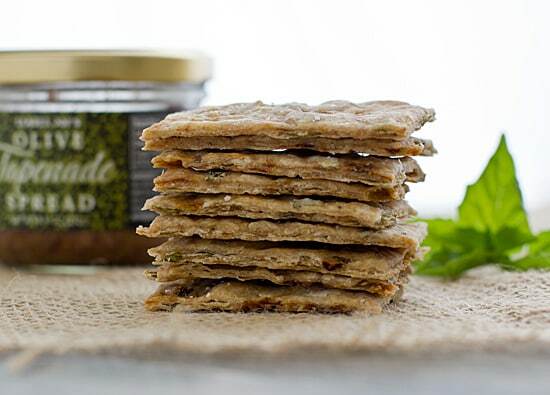 These Basil & Sun-Dried Tomato Crackers are delicious by themselves or with a little olive tapenade or cheese. 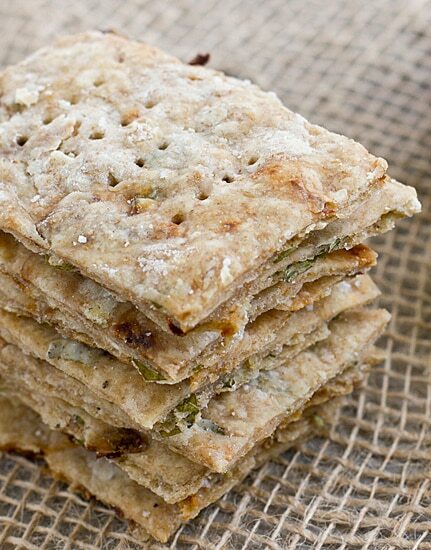 Adapted from Wheat Crackers on Allrecipes.com. Whisk together flours and salt in a medium bowl. Add olive oil, water, sun-dried tomatoes, and basil and stir until just combined, being careful not to overwork the dough. Line a large baking sheet with parchment paper. Transfer cracker dough to baking sheet and roll out dough to about the thickness of a saltine. Use a knife or pizza cutter to mark dough into rectangles–don’t cut the dough all the way through, just draw the lines on it. Prick each individual cracker with a fork a few times and sprinkle with sea salt. Bake for 15-25 minutes or until crisp and just beginning to brown. Baking time depends on thickness of crackers, so be sure to keep an eye on them! Allow to cool completely and then break sheet into individual crackers. Store in an airtight container; if crackers get stale, bake at 225 degrees for 10 minutes or until crisp. I’m really picky on which recipes I use but these were amazing . Roll as thin as you can ! These no yeast in this recipe! Grat for Passover! Ik heb een vraag: wat bedoel je met “c”?